Just a few years before the Second World War the Germans practiced and perfected their use of aerial bombardment of the civilian population during the Spanish Civil War, when the fascist governments in Italy and Germany provided help to Franco’s rebels in overthrowing the government. Picasso’s giant mural “Guernica” depicts the atrocity but it is true to say that even within Spain (at least in the south), there are many who are unaware of the horrific bombing raids that virtually annihilated the town of Guernica, the historic heart of Spain’s Basque country. The Basques had been granted autonomy within a Spanish state but it was no part of Franco’s plan to allow this to continue; it was in Guernica that generations of Basques had gathered around an ancient tree to debate the laws and elect their leaders and so Wolfram von Richthofen, commander of the aerial attacks on Spanish targets, chose Guernica for what was to become one of the bloodiest attacks on a civilian population in history. As Guernica embodied the Basque spirit and history, then Guernica had to be destroyed. Dave Boling’s “Guernica” tells the story of the Navarro and Ansotegui families, joined in marriage and united by tragedy, in particular the three Ansotegui brothers, Justo, Josepe and Xabier. It’s essentially a family saga covering three generations but the main focus of the story is the bombing of Guernica. The story begins as the three brothers are growing up; their mother dies young and their father – we don’t learn exactly why but we can guess – abandoned the boys a couple years later. Justo assumes responsibility for his younger brothers; he’s a determined and headstrong young man who, when he grows up, is known throughout the region for his physical strength. He marries a local girl, Mariangeles, and they have a daughter Miren. Meanwhile, Josepe, the middle brother leaves Guernica and heads for the coast, becoming a fisherman. The youngest, Xabier, leaves for a seminary in Bilbao where he trains to become a priest. Xabier is different to many of his fellow priests and he won’t be persuaded to fall in line with Vatican orders to tacitly support the fascists. He is kept informed of the progress of Franco’s rebels by Aguirre, the first official Basque President, who passes on information under the cover of the confessional. As the situation becomes more grave and the rebels move rapidly north, Xabier feels compelled to go to his hometown to warn his family and the people of Guernica about the danger. Although there weren’t quite as many characters as I’d expected for a multi-generational saga, I did find at first that I had to flick back to remind myself who some of the characters were and I’ll admit I was a little lost quite early on and almost gave up, something I rarely do with a novel. I can see why Boling chose to stretch the story from the childhood of the brothers because the experience of Justo in particular has a great bearing on how he behaves as a husband and a father, especially in the latter part of the story. However, it did create an imbalance between the development of the various characters with some being quite sketchy and others being over-developed. An interesting addition to the narration was provided by occasional short sections told from the points of view of Pablo Picasso and Wolfram von Richthofen. Picasso had been approached and asked to give his backing to the fascists but he deplored what was happening in his home country and painting “Guernica” was his way of telling the world what had happened there. Von Richthofen congratulates himself about the “successes” of the bombing missions; it is an unnerving insight into what would be inflicted on Britain in just a few years. The overall story is thoroughly engaging and I loved the descriptions of Basque life. Boling is a journalist turned author but he clearly knows that a novelist does not tell but shows. Basque traditions – dancing, food, the family structure – are woven nicely into the story and prove illuminating. The trouble is that the story as Boling relates it is highly romanticised and lacking in the background development that would render the story more whole for readers who don’t have much prior knowledge of the conflict. There is also the paradox that if you do have the knowledge, you’ll know how much Boling conveniently skims over or disregards altogether. The Basques had been looking over their shoulders since the early 1930s; it was against the law to speak the Basque language in public and the celebration of Basque festivals was largely outlawed. The impression one gets from “Guernica”, however, is that right until the time of the attacks, the people of Guernica were merrily going around being as Basque as they possibly could. This is echoed in the idea that everyone in Guernica (and the Basque country in general) was against Franco. There is a simple stance of rebels bad, Basques good and while one cannot deny that the Basques suffered a terrible fate, Boling’s presentation of the situation is hugely biased. He fails miserably to get across the truth that the Spanish Civil War split many families, even among the Basques. There is a reference to some people denouncing their neighbours – people can turn against good friends if hungry enough – but it’s not elaborated on; no explanation of how the informants were dealt with and we are left wondering who in this story might have been going off to the police with tales about their neighbours. The best part of “Guernica” is the description of the attack itself. It is, at the same time, restrained and yet graphic. When Alaia, a blind friend of the Ansotegui family, is left alone in the marketplace to look after herself, my heart was thumping hard inside my chest and I felt tears welling up. The descriptions of people machine-gunned as they tried to run for cover and people suffocating in hastily erected but inadequate shelters were sickening but absolutely necessary. The immediate aftermath is also described with harrowing reality, conscious people with their limbs trapped, unaware that the building they were in was about to collapse. I must admit to being surprised at how much this section of the novel moved me. Taking into account the novel’s title and the unnecessary prologue which in effect reveals the final outcome, I was amazed by how much Boling’s telling of the actual bombing affected me. At first I wasn’t sure about the idea of introducing the thoughts of Picasso and von Richthofen into the story. They don’t interact with any of the fictional characters but (assuming one does know their connection with what happened in Guernica) their inclusion adds a sinister sense of foreboding and heightened the charged atmosphere prior to the attack. Boling has chosen to tell the story from the personal (the Basque) point of view rather than the political. Xabier is the only one of the brothers to have any kind of political insight and although he stands in Guernica’s church warning of the rapidly advancing rebels, you get the impression he’s doing it more for his family than for the town in general. Curiously there’s no discussion of what’s going on elsewhere until the rebels are almost at the door and even then there’s none of the debate I’d expected to read about. There’s no gossip, no rumour, no bravado, it just isn’t mentioned at all. Despite the contradictions and failings, “Guernica” is a highly engaging and readable novel. As a family saga it doesn’t have characters you can care sufficiently about; in fact, the main characters are caricatures rather than real people you can believe in. As a historical novel it misses the mark too; a few details don’t ring true and there are problems because some areas lack explanation and background, whereas others are bogged down in too much detail. Still, this is a first novel and there is a great deal for Dave Boling to be proud of. Don’t be fooled by favourable comparisons with “Captain Corelli’s Mandolin”, “Guernica” is nowhere near as brilliant as Louis De Berniere’s excellent novel. However, time spent reading “Guernica” is not wasted; this may be a rather light account of the bombing of Guernica but there is no disputing the fact that Boling tells a good story. I look forward to his next and hope that he’ll put right the mistakes of his first. 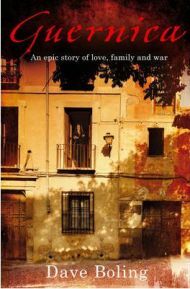 For a more realistic look at the hardships faced by civilians during the Spanish Civil War I would suggest that CJ Sansom’s “Winter in Madrid” is a better read. For a simplified but better constructed of the war in general and it’s impact on one family, Victoria Hislop’s “The Return” is an good read.